The area affected is 300 metres either side of Rushes Lock. Fish lost include bream, tench, chub and carp. The Environment Agency have been on site since yesterday (9th Oct). Oxygen levels were down to 5% at one point – up to 35% now (still not good, but not fatal). The EA have aerated and opened the locks to move water through. Current theory on cause is that the sudden temperature changes last week caused an algal bloom which in turn dropped the oxygen levels. The canal company is also aware of the situation. The EA will site visit daily and when the oxygen levels stabilize they will do a fish survey to acces if re-restocking is required. The Angling Times have been informed so do not be shocked if you read about this in the angling press. A section of canal between Papermill Lock and Hoe Mill lock recently suffered a sudden drop in dissolved oxygen levels. This impacted severely on the fish populations in this stretch especially around Rushes lock where levels were around 5-10%. We responded by opening the flaps within the lock gates, aiding the movement of the water and drawing the oxygen rich upstream flow down into the depleted area. We also deployed aerators to the slacker section to try and raise the oxygen levels. Within 6 hours the dissolved oxygen had reached 40% and had shown rapid recovery. Investigations of the incident are also in progress through water samples and examinations. We are continuing to monitor the condition of the stretch. A contractor has been at the site for the last few weeks and has been keeping a record of carcass counts and any abnormal activities within this stretch. To date 10 large Bream, 5 carp 3 eels and about 50-60 small perch and roach have been recorded. This is a small proportion of the fish seen struggling when the oxygen was low so our actions are believed to have prevented a very serious incident. The local fisheries team has been overseeing our involvement and has been in regular contact with the affected angling clubs. 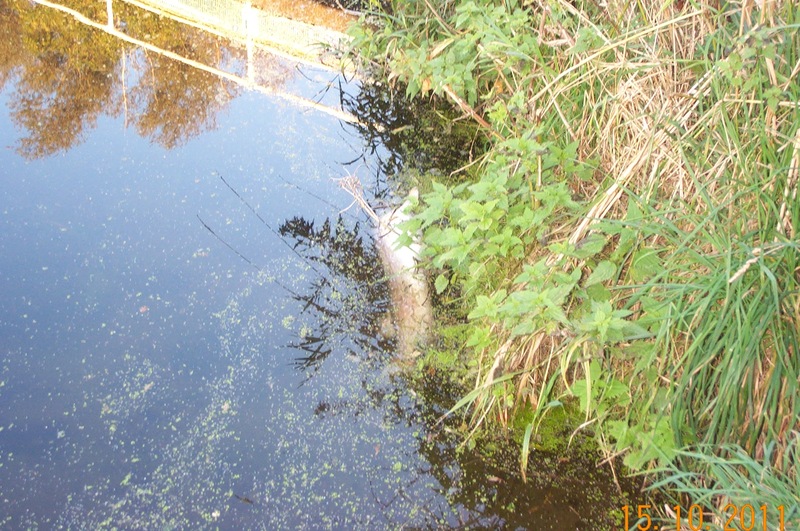 The incident has been picked up by the Anglers Mail and is likely to be reported in next weeks edition. One of the dead pike in the edge. Bailiff Simon Putnam invited a friend, Alan Godden from Romford, to join him for a days fishing at Bog Grove and I think his £8 guest ticket was well appreciated. Alan was float fishing in the margins with sweet corn, and had a 2lb chub within minutes of setting up, followed by this 3lb 8 oz crucian then two double figure common carp. 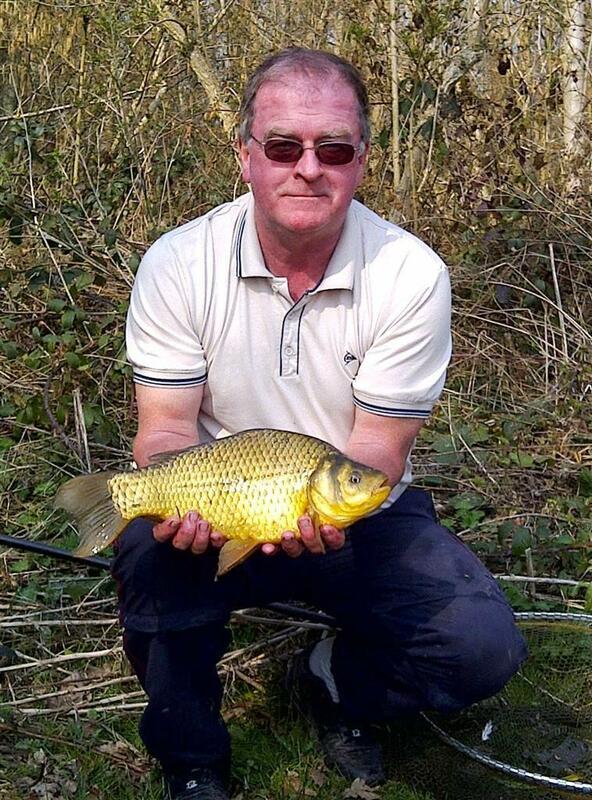 Alan’s been almost a professional match fisherman over the years but has never had a crucian this big before. He went home a happy man. Like a bar of solid gold!